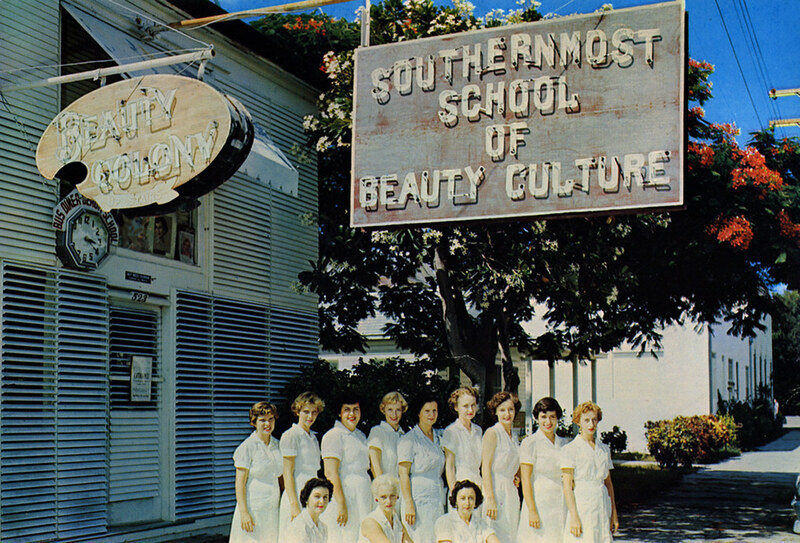 This picture taken in Key West, Florida shows the Southernmost Beauty School in the United States. The young ladies pictured with the teacher, are students learning to become professional beauticians. The white flowers showing on the tree behind the school sign are frangipani blossoms. The frangipani tree thrives only in a tropical frost free climate such as that in Key West and it blooms nearly all year around. The other tree with the red clustered blossoms is a royal poinciana. This royal poinciana blooms from May to October and can survive light frosts well enough to grow quite plentifully throughout tropical south Florida. The Southernmost School of Beauty opened sometime in the late 1930s/early 1940s in Key West, Florida. Operating as a “beauty colony” that taught young women about hair, makeup and beauty. In 1959, when Hawaii was admitted to the Union, the name of the school was forced to change as Key West was no longer the Southernost point in the United States. The newly rechristened Key West School of Beauty Culture lasted through the early 1960s.